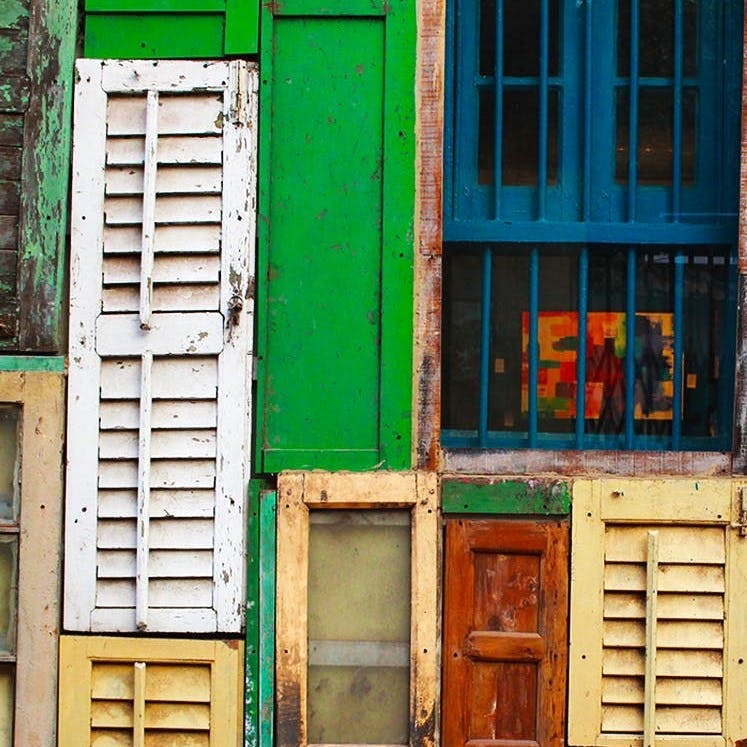 Kolkata is known for amazing architecture, and the louvre windows (the slatted windows in old houses) are a typical look of this city’s past. Now that so many old houses are getting (regrettably) broken down, a lot of the stuff they had is landing up in markets and street shops. You can find the louvre windows being sold on several streets around the city. They can add charm to any space (like the Artsy Cafe wall). We found two spots in the city that sell them, and they’ve got them in all shapes and sizes. We loved the way Artsy’s outer wall has been done up as a collage of colourful louvre windows. Owner Arshdeep tipped us off to this area selling secondhand furniture. We followed the trail and reached Rifle Range Road from Bondel Bridge end. The stretch of road starting from Ustad Vilayat Khan Park to Lohapool More (near Adi Ballygunge School) is lined with makeshift furniture shops (more like workshop shades) selling just doors and windows. Jhilmils (jalousies or louvres with no handles to manoeuver), louvres with handles and louvres girded by rods – you’ll find a wide variety of them here. Available in different colours, they are often chipped in several places and will need to be revamped with a fresh coat of paint and sanding. Sold mostly by piece, these are priced between INR 1,200 – 1,500. We got to know of this hood from Rahul Dhankani of The Lighthouse Cafe, another cafe owner who has used repurposed furniture extensively to do up his cafe. With Tiretti market on your right, walk down past it for a few yards until you come across a lane on your right that connects Poddar Court to BB Gangully Street. All along the lane are rows of ramshackle furniture shops and workshops which the locals refer to as kabari dukan. You’ll not just find windows and doors, but also old cupboards and chests. If you’re lucky, you may also find some made of sturdy Burma teak! They have old short windows to glass and wood combination louvres, so you’ve got to have a keen eye to spot unique finds. Don’t shy away from haggling, but be warned that most of them lack hinges and frames. Priced mostly between INR 2,500 – 3,000, you can be sure to find your required size here. They are open on all days of the week, except Sundays (the second half). Before you head here for a buy, it’s also best to make arrangements for delivery because these sellers don’t deliver.